Today, we come together as the Church to commemorate St. Joseph, the Spouse of The Blessed Virgin Mary, and the foster Father of our Lord and Saviour,Jesus, when he became one of us here upon the Earth. In the same way in which God, our Heavenly Father, who gives each of us as his children, unconditional love, care, stability and who sets us the standard with which we should strive to live our lives with his holy word in the scriptures, a true Father to each and every single one of us, who only ever wants the very best for all his children. St. Joseph follows our Father’s example, as both husband and foster father. He gives us examples which men should follow in their lives. Joseph cared for and provided for the Holy Household. There are many qualities that Joseph had which we could use to be the role model for Christian husbands and fathers. Joseph was a very compassionate man. We can see an example of this when he suspected his wife of infidelity; he planned to divorce her quietly rather than denounce her publicly and expose her to public shame and penalty. Joseph was always obedient to God and did what he knew was God’s will without thought or hesitation. Examples of this are that he kept Mary as his wife; he protected and provided for his family when they had to flee to foreign lands to protect them from danger. Joseph led a life of deep prayer and was in communion with God, and would always seek out that which was God’s will. God often told Joseph his will using dreams. Joseph was a provider of care, When Jesus’s life was threatened, Joseph would take them out of danger. He took his family to Egypt and only returned when it was safe to do so, and when Jesus went missing at aged twelve, Joseph went searching for him because obviously, both parents were obviously extremely worried about Jesus’s safety. Joseph also brought much more to Jesus’s life, he taught him his trade which Jesus worked in for about twenty years, he gave Jesus the love and stability he as any child needs, and was his earthly male role model, which was and still is vitally important for a good father to give any child. He was a man with a firm faith in God coupled with a resilient personality, who did not complain and was not appalled nor distressed in the midst of trials and tribulations, St. Joseph knew how to face, carry and solve the burden of his vocation, of life’s difficulties and responsibilities with serenity, with complete faith and love, entrusting himself totally and unconditionally to God’s plans. Sadly not all children are brought up in such a way today, but husbands and fathers truly should seek to follow this sincere man of God in the way they run their lives. Are you married? Do you give all the love, trust and respect to your spouse? Or with stresses and strains do you always argue or not truly make time for each other? If you have children, do you know where they are and if they are safe, or who they might be talking to online? Do you give emotional stability, patience and unconditional love? Do your children see you as the role model they need in a Father? We should always strive to be as our heavenly Father is to each of us, whether that be to our spouses, to our children, and in fact to all as our brothers and sisters. While the Gospels do not shed much light on St. Joseph’s life, it is believed that he died before Jesus’ public ministry. 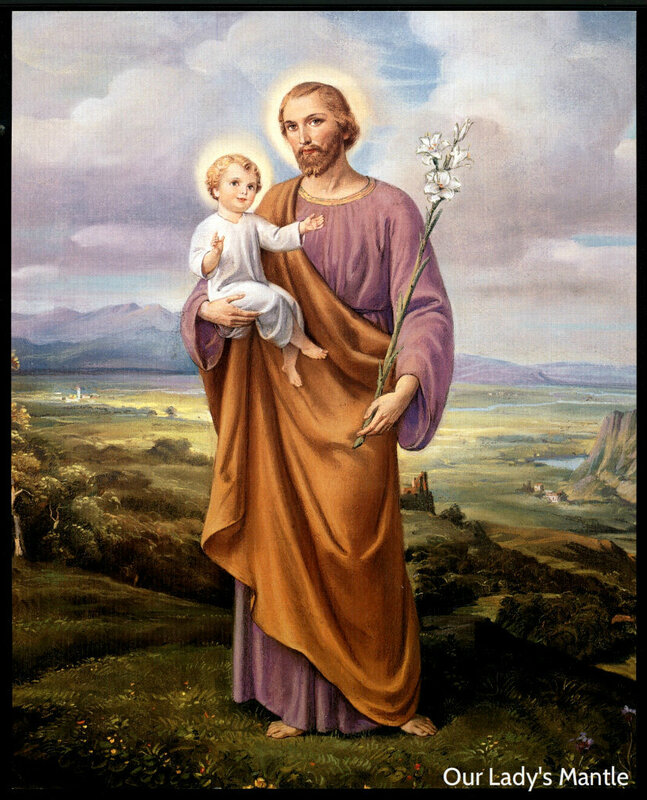 St. Joseph is the patron of fathers, spouses, priests and seminarians. But also, St. Joseph teaches us so much by his silent example of his life, and just how we should love God faithfully and obediently. We pray to God through your powerful intercession for all the fathers and spouses in the world so that they may imitate you in your faith, love and fidelity to God and your family. We entrust to you as well all the families in the world so that they may imitate the virtues lived by the Holy Family of Nazareth and become its faithful image. Through your intercession, may God shower more vocations to His Church, especially the vocation to priesthood, and may all priests and future priests strive be holy, faithful and apostolic ministers of Christ.